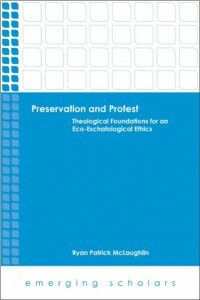 Centre Associate Fellow Dr Ryan Patrick McLaughlin has published a new work entitled Preservation and Pr otest: Theological Foundations for an Eco-Eschatological Ethics. This is his second published book, following his February 2014 Palgrave Macmillan publicationChristian Theology and the Status of Animals: The Dominant Tradition and Its Alternatives. In Preservation and Protest Ryan proposes a novel taxonomy of four paradigms of nonhuman theological ethics by exploring the intersection of tensions between value terms and teleological terms. McLaughlin systematically develops the paradigm of cosmocentric transfiguration, arguing that the entire cosmos shares in the eschatological hope of a harmonious participation in God’s triune life. With this paradigm, McLaughlin offers an alternative to anthropocentric and conservationist paradigms within the Christian tradition, an alternative that affirms both scientific claims about natural history and the theological hope for eschatological redemption.